You might think that you need to have huge studio headphones to get rockin’ bass, but that isn’t the case at all. We’ve compiled this list of the top ten earbuds that will make all of your audio sound amazing. 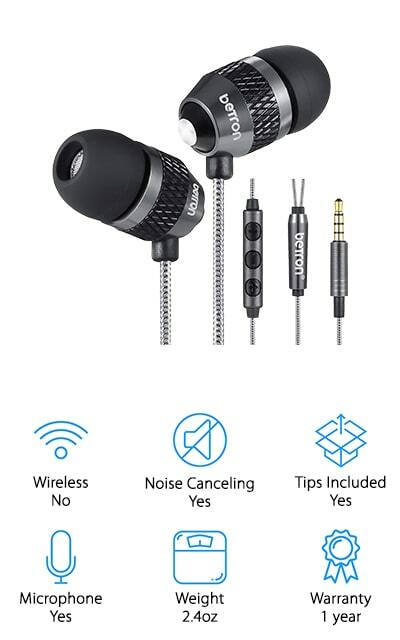 Everyone deserves to hear the best audio possible, so make an investment in these amazing earbuds! Before we get started, here are some things you should know about these premium earbuds. Wireless: Some people prefer wireless earbuds, and some are attached to their wires. We’ll let you know here if the earbuds we’re talking about are used wirelessly or with a cord so you can choose your favorite. Noise Canceling: When you’re jamming out to your favorite music, you don’t want to hear anything else. 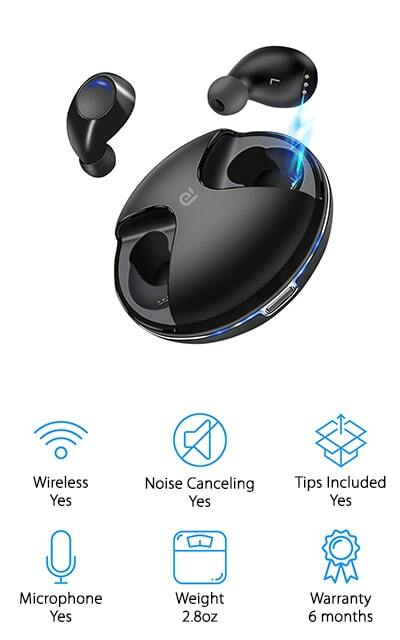 Here, we tell you if you’ll be able to hear any outside noise while you’re walking around in public places. 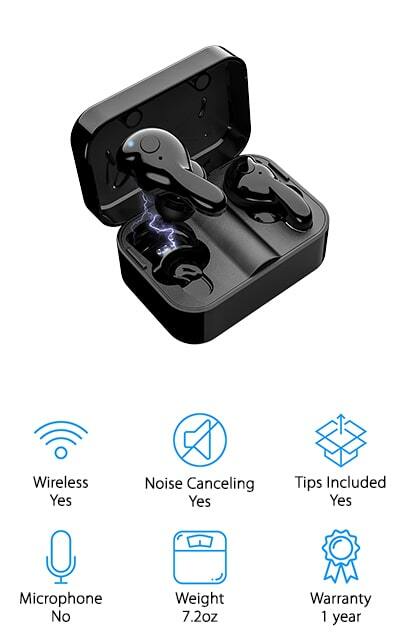 Tips Included: Every ear is different, so most earbud manufacturers will include differently-sized tips to make them fit comfortably for everyone. We’ll let you know if that’s the case with the earbuds we’re discussing with this information. 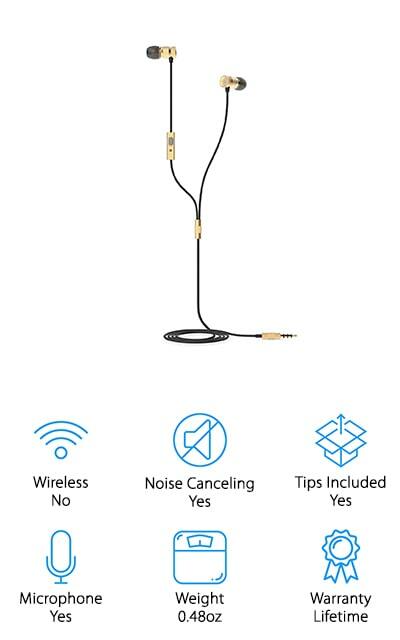 Microphone: Most high-quality wireless headphones include an in-line microphone on one of the buds. 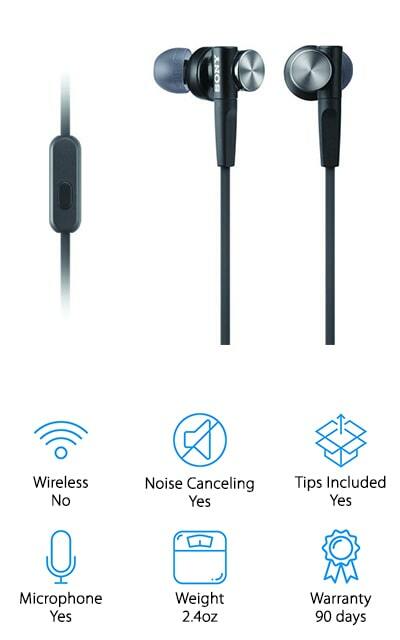 Wireless earbuds can sometimes have a microphone included, but it’s definitely not as common as it is with wired earbuds. We’ll tell you here. Weight: How much do the earbuds weigh? It’s important that you choose ones that are going to feel lightweight and comfortable in your ears. The lighter the better is the general rule with weight for earbuds. Warranty: A warranty is an assurance from the manufacturer that they stand behind their products. 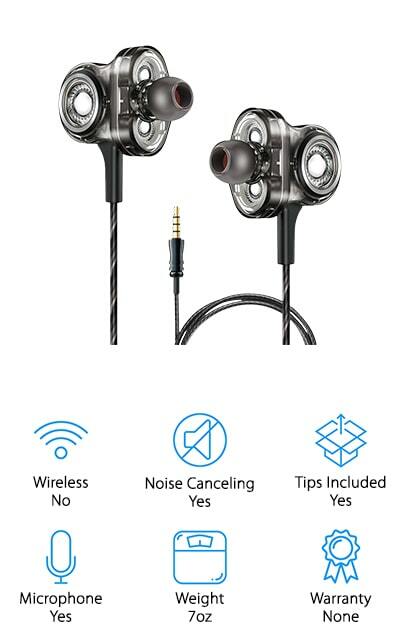 If it stops working or breaks during normal use in this time frame, you can get a complete refund or even replacement earbuds. What earbuds have the best bass? That’s entirely up to you. However, we’ve compiled a list of earbuds that might just fit your description of the perfect bass earbuds. Our top pick and budget picks are highlights and our personal favorites. Check them out before you jam down through the rest of the list. Get the earbuds that will make your music sound just like they intended it in the music studio! Our choice for the best bass wireless earbuds is these ones from VaKo. They are ergonomically designed so they fit naturally inside of your ear, so you get the best and most comfortable wear for the long haul. They are extremely lightweight for wireless earbuds and are water resistant, allowing you to wear them when you jog or work out. Even the earflap design helps to keep them in place while you’re engaging in any sort of activity. It’s easy to pair these to your device via Bluetooth to your device. When you take them out of the charging case, the Bluetooth capability switches on and allows you to connect them to your phone or another Bluetooth device. On a full charge, you can get up to 3 hours of playback without having to charge either the earbuds or the charging base. They include HD rendering technology with great sound quality and amazing clarity, plus noise canceling technology! When you need cheap earbuds that still deliver the bass, take a look at these Sony Extra Bass earbuds. They are wired, so you don’t have to charge them or worry about paring, but they come with a 12mm driver unit to deliver the deepest bass in this price range. It includes integrated microphone use and a separate controller for smartphone playback. 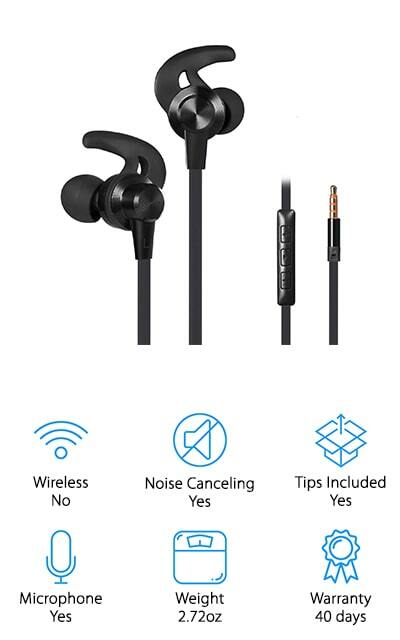 The tips of the earbuds are made of a comfortable hybrid silicone that rests comfortably in your ear, and there are three different sizes of earbuds included so you can choose the perfect fit for your ear. The cord is flat and has a slider to keep it from tangling, so that’s another perk – many people prefer wireless headphones because of the cord issue, but that is gone here. They are extremely lightweight at only 2.4 ounces per bud and include powerful neodymium magnets and drivers to help balance the sound and deliver the best bass possible. Kissral is next on our list with these easy-to-use, easy-to-pair wireless earbuds. They automatically pair when you take them out of the case, so long as you’ve paired them with your phone before. That’s a huge technological from manually-pairing Bluetooth earbuds. 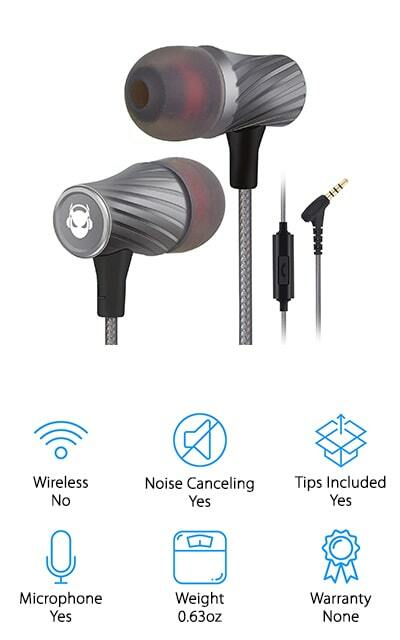 But that isn’t where the technology stops – these earbuds contain a Realtek Bluetooth chipset and noise reduction technology. With these wireless earbuds, best bass is absolutely assured. They have between 4 and 5 hours playback time on a single charge, and the portable charging case can extend that to 15 hours if you’re out and about a lot. The practical charging case is shaped like a flying saucer, ergonomic and easy to take with you. The earbuds themselves are comfortable and fit perfectly into your ears with no pain after wearing them for long periods of time. Plus, they are waterproof so you can use them in the rain or at the gym. That’s amazing! A&S makes these best bass heavy earbuds that don’t require charging at all. They have a total of three different drivers – two dynamic drivers for sound, and a separate balance driver so that you can get the best sound possible no matter how deep the bass is or how high the soprano runs. You can control the volume of your earbuds easily, and the in-line built-in microphone also allows you to take calls in the middle of your audio. When you’re wearing them, you won’t hear anything else because of the way that they are insulated against outside noise, and that’s great! The tips of the buds are silica, and this pair comes with three different sizes of silica earplugs as well as a high-density memory foam tip set so you’ll always be comfortable with your earbuds. It doesn’t get much more dedicated when it comes to comfortable, long-lasting wear. It’s like hearing your music for the first time! ZEUS is next on our list with these dual-driver earbuds that present the audio in two different ways. This allows the treble and bass to balance together. It’s almost as good a live music! They’re some of the best earbuds for bass and sound quality on our list because they can really dish it out. All of your audio will sound absolutely amazing with these heavy bass earbuds. The speakers are now wider to produce bass without distorting the sound at all, and when a call comes in, you can answer it without fishing out your phone. You can also use the in-line controls to skip songs and pause/play your music. 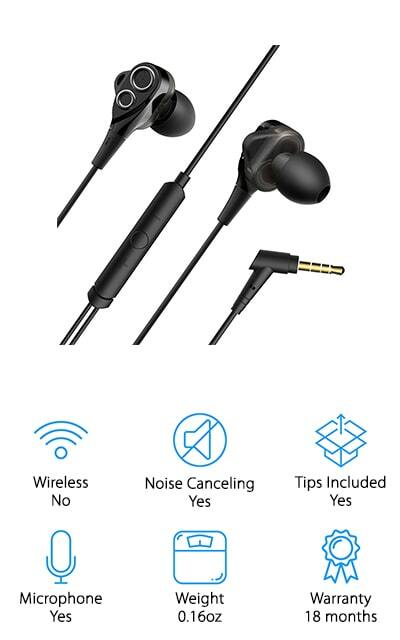 You can even get an extension for these earbuds to use them for a wide variety of applications, from gaming to moving freely around the room while your phone is charging. These are some amazing and clear bass earbuds that you’re going to love. VAVA MOOV makes some of the best earphones for bass lovers who don’t want to trifle with the charging docks and pairing features of Bluetooth headphones. 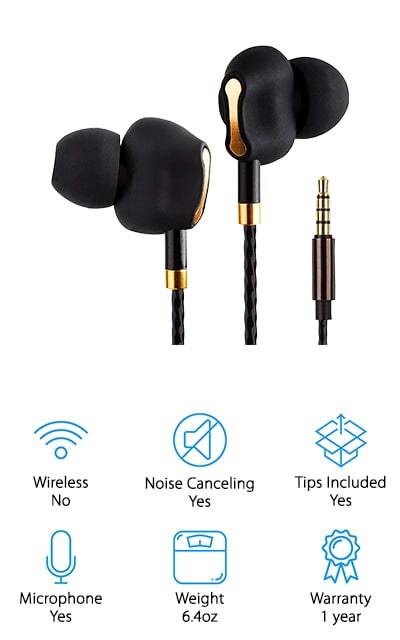 These earbuds include an in-line microphone and control panel that allows you to access voice assistance on your phone without ever touching it. These inline controls are waterproof and allow you to skip tracks, adjust volume, and issue voice commands to get your phone working the way you need it to without using your hands. They include two drivers so that you hear your music and other audio the way it was meant to be heard. Earbuds with a single driver just can’t come close to the sound quality that a dual-driver headphone provides. They are snug and secure and won’t fall off or out of your ears. They also include different tip sizes for all different users! If you’re looking for a balanced sound that improves clarity and quality look no further. Acode makes these bass earphones that allow you to make calls hands-free. You can control your smartphone with voice controls or the in-line remote, as well as skipping songs and playing your music. Other features of the inline controls include volume adjustment, answering and ending calls, and skipping through songs without ever touching your phone. Use it to activate your voice assistant without having to look at your screen. The coolest part of these wired headphones is that there is a magnet in each bud. They attract together to keep your cord from tangling. With this many features in the built-in microphone and remote, you definitely don’t want them tangled up in your pocket! Did we mention the sound quality? Because these are sound isolating, bass-driven stereo headphones that give you the best bass in their class. If you haven’t tried them yet, you’re definitely missing out on these convenient, metal-housed powerhouses. Try them out today! These GGMM Nightingale Earbuds are some of the best earphones for bass and sound quality on the market right now. As a testament to that, each purchase includes a lifetime warranty. These headphones are actually incredibly light, so they are going to fit perfectly and comfortably in your ear. There are three extra sets of ear tips so you get the perfect fit. They are made of aircraft-grade aluminum to make them sturdy while still being lightweight. The cord is hollow and packed with hand-threaded copper wire, so you know it’s going to last forever. The 3.5mm jack is gold-plated for style and quality. The in-line remote and microphone allows you to start calls and end them, control everything about your music, and do volume control as well. Keep the music going and skip through your songs without ever touching your phone. They are so lightweight at only 0.48 ounces per bud, and we’re sure they’ll be your constant companions! MINDBEAST makes some of the best earphones for bass and clarity on our list. They have powerful sealing for noise isolation so you can hear your music and only your music. It reduces at least 90% of ambient noise so you can focus on relaxing! They include an exclusive driver with deep bass paired with ultra-clear sound to give you the best audio experience. There are three different pairs of silicone tips that come with these earbuds, so you can get the best fit without them falling out of your ears. They are sweat-proof as well so they are the greatest wired companions for working out at the gym. They are compatible with all 3.5mm jack devices and even come with a neat portable case that’s made of smooth leather, with a waterproof and dirt-proof zipper. The built-in mesh bag in the carrying case keeps the earbuds and 5-foot extension cord from tangling up when you take them off. Betron makes the last earbuds on our list, a pair of wired headphones with deep bass drivers. They include different sizes for the tips so they can fit right inside your ear canal without falling out. They have a built-in microphone and, of course, include an in-line volume control remote so you don’t have to dig for your phone each time you want to adjust the volume. It includes a carrying case so you can take them with you and they won’t tangle up, as well as a 1.2-meter long cable so you’ve got more freedom of movement if that’s what you’re into. The bass pounds out of these amazing earbuds via the high-powered dynamic speaker system that gives you the best sound each and every time. You haven’t really heard your music until you’ve heard it on a pair of earbuds like these. The Betrons are a great jumping-off point when you’re looking for bass headphones.